Versatile Nobo Glide Drywipe Marker Pens deliver clear, brightly coloured writing on flipchart easels and whiteboards. 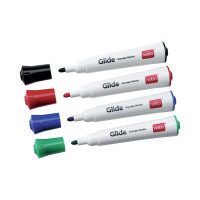 This pack of 4 Nobo Glide Drywipe Marker Pens are perfect for use on flipchart easels and whiteboards. They feature a standard (3mm) bullet tip, and ensure that you can get your work done professionally. This pack contains one of each of the following colours: black, blue, green and red.